All ingredients are naturally-derived. 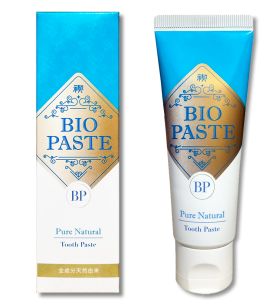 BIO PASTE does not contain abrasives, surfactants, mineral oil-derived substances, Old Specified Labeled Ingredients and fluoride. Ion-exchange processed purified water in use. Derived from rapeseed. One of the ingredients that compose the base of toothpaste. Effective in retaining moisture in the mouth. Derived from plant fiber (pulp). Employed as a thickening agent in food, cosmetic and medical products. Natural mineral salt extracted from Utah’s salt lakes. A sweetening agent that prevents cavities. Stops decay-causing plaque from forming and boosts the re-calcification of the teeth by stimulating the secretion of saliva. Also has the ability to weaken the activity of the streptococcus mutans bacteria. The porous structure of silica gives it the ability to absorb stains and odors on a molecular level. The micronized form of silica is used so teeth is coated and gently cleaned without damaging the enamel. Combined in toothpaste to provide freshness and to prevent bad breath. Extracted from the peppermint plant, it is used widely in the fields of food, medical and cosmetic products. Sea Salt is rich in minerals and its effects keep the gums firm and stimulate blood circulation. From the stevia plant. Helps to adjust the flavor as well as restrict oral bacteria. A natural preservative also used in food products and household cleaning materials. An extract from grapefruit seeds. Extracted from the licorice plant and used widely in traditional Chinese medicine and cosmetics products. Recognized to prevent periodontitis (pyorrhea), gingivitis and bad breath as an ingredient in quasi-drugs. Used as “baking soda” in food products. Aids in removing teeth stains when used in toothpaste. A natural anti-bacterial substance richly included in the essential oil extracted from the hinoki plant. Effective against the periodontitis pathogen and Candida bacteria in small amounts. Also used as a food additive. This is the green-colored substance found in the chlorophyll of plants. While it is mainly used as a coloring agent in food products, it also contains a deodorizing ability and is combined in toothpaste to prevent bad breath. Derived from the peppermint plant. Peppermint oil is the essential oil made by the steam distillation of the aboveground portion of the peppermint plant which is then cooled to separate the crude menthol and further refined to adjust the menthol content. Menthol is made by the further refining of the crude menthol by recrystallization. icon-exclamation-circle A food-grade safety level that contains only naturally-derived ingredients. icon-exclamation-circle High cleansing ability to remove teeth stains. icon-exclamation-circle Does not contain any abrasives or surfactants. icon-exclamation-circle Strong alkalinity that can be used to prevent tooth erosion. icon-exclamation-circle A high oxidation reduction that prevents bad breath and the re-adhesion of plaque. icon-exclamation-circle The functionality to be used as a mouthwash. icon-check-square-o The Increasing Need for Better Oral Health Care. A study by dental experts regarding how oral bacteria majorly affect the overall health of the body has become a hot topic in the United States. The Society of Internal Medicine in Dentistry was founded based on the findings that many lifestyle diseases are caused by bacteria entering the body through veins in the oral cavity. The awareness that good oral care is essential to maintaining and preserving good comprehensive health is also rapidly growing in Japan. Even when not swallowed the mouth slowly absorbs substances into the body due to sublingual and transcutaneous absorption. The inside of the mouth which made up of mucous membranes, is an absorptive area, particularly the sublingual area, as demonstrated by nitroglycerin tablets, a sublingually-administered myocardial infarction medication. While many toothpastes contain petroleum-based surfactants and chemicals to increase cleansing abilities, a safety level equivalent to food products is imperative in a toothpaste used every day in oral care. Many commercial types of toothpaste contain petroleum-type substances which are easily absorbed from the oral mucosa and then accumulate in the body. These are prohibited in food additives, yet used in toothpastes. There are reports that the cancerogenesis rate is higher in water-fluoridated areas than in non-water-fluoridated areas. Toothpastes that contain fluoride may lead to higher chances of cancer and is being identified as a serious problem. icon-check-circle-o BIO PASTE does not contain any abrasives, surfactants, mineral oil-derived substances, ethanol,Old Specified Labeled Ingredients and fluoride.